I’ve wanted to share it for so long. Today, we had one of those windy, wet, cold days and it was the perfect excuse to tell the kids we are chilling. We turned on Home alone and I got to editing pictures. Don’t let this tutorial intimidate you! 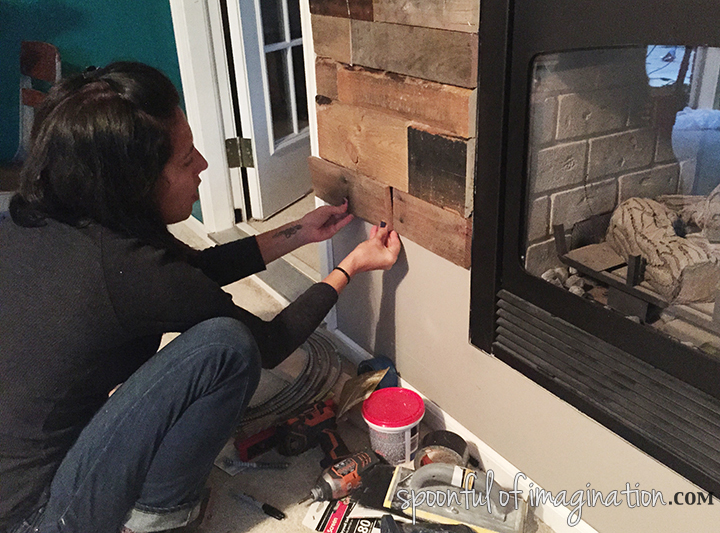 If you have been wanting to try your hand at creating a pallet wall, you got this! Before you begin though, if you don’t already own the Ryobi Airstrike Brad Nailer, open up another little tab on your computer and purchase one. It’s our favorite tool and the one that saved us on this project. We started with this thin wall. 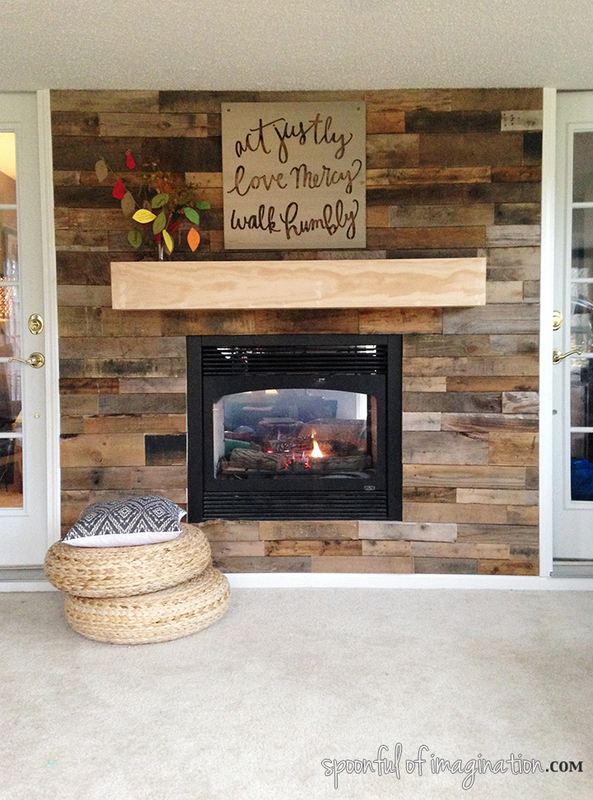 For as long as we have been in this house (a year now), I have wanted to pallet that wall. It’s small and broken up with the fireplace. It’s the perfect wall to turn into a fun accent wall. I’m not sure what the previous owners had in that little wall nook. It’s always been an awkward space for us. 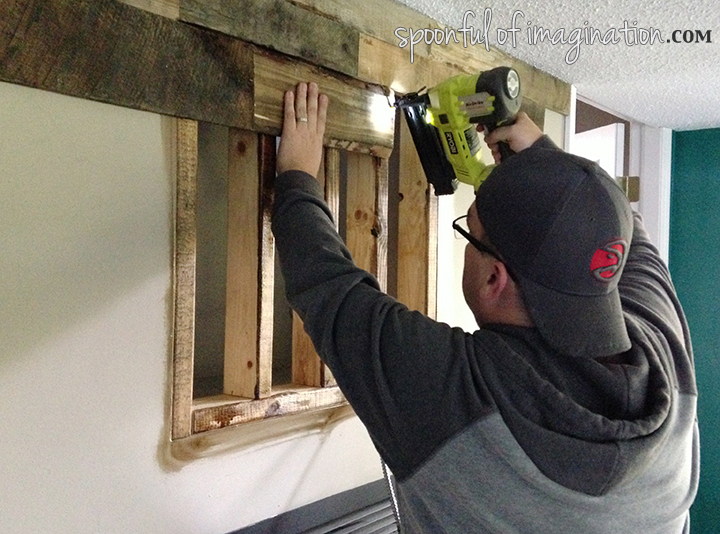 This pallet wall would fix that issue as well-we covered it up! This is more Matt’s expertise than mine, he did a great job preparing the space to be covered up. 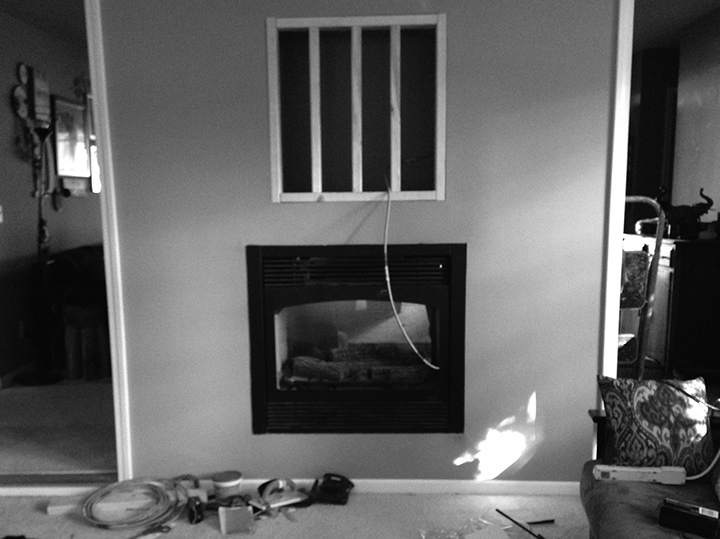 First up, he moved the outlet to outside the nook, so we could use it in a mantel. Please note: if you do not have experience with electrical work, find a friend who does or hire that step out. 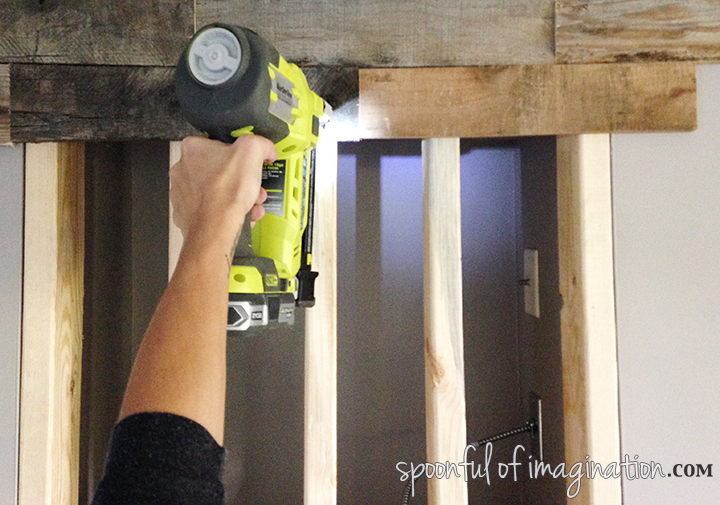 He then used our Ryobi Brad Nailer to build studs in the nook. This gave us something to place nails into to attach the pallet boards. 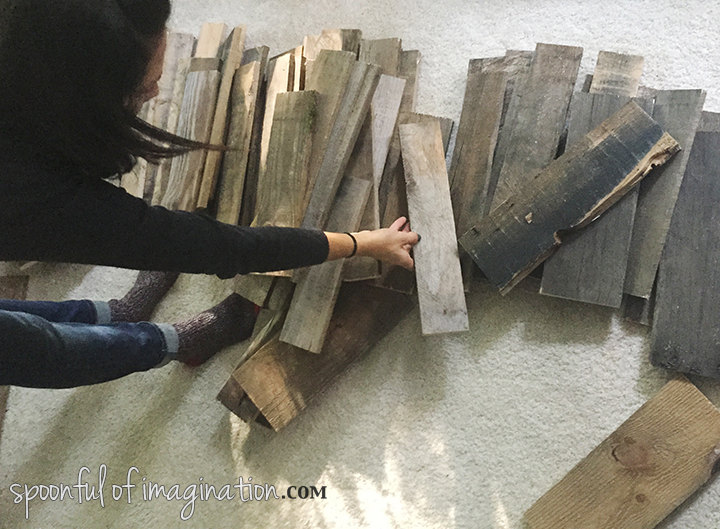 If you are just joining in with this project, click over to this previous post to read how we easily tore apart pallets to create our supply of wood. Once I had a big pile of pallet wood, I sorted it into three piles. I tried to separate it based on coloring. I ended up with a yellowish pile, a grayish pile, and a dark blackish pile. 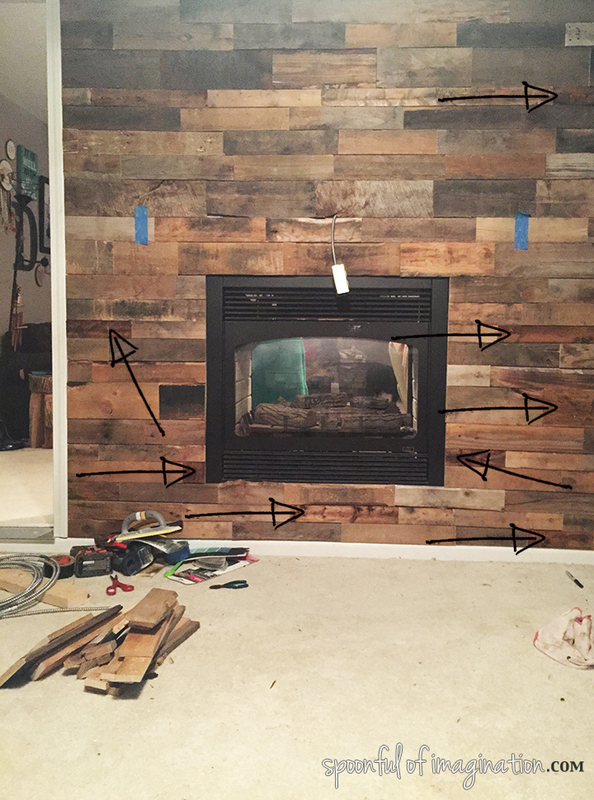 to have each row of pallet wood be broken up by color so no two boards of the same shade were ever next to each other. This goal would keep the wall from looking like stripes. Having the piles of different color shades helped make this step easier. I wanted to break up the rows with different width of boards. I had limited “wide” pallet boards and I wanted to make sure that all those rows weren’t at the top and then we just got thinner rows all the way down. I alternated having a wide row and then a thinner row as much as I could. 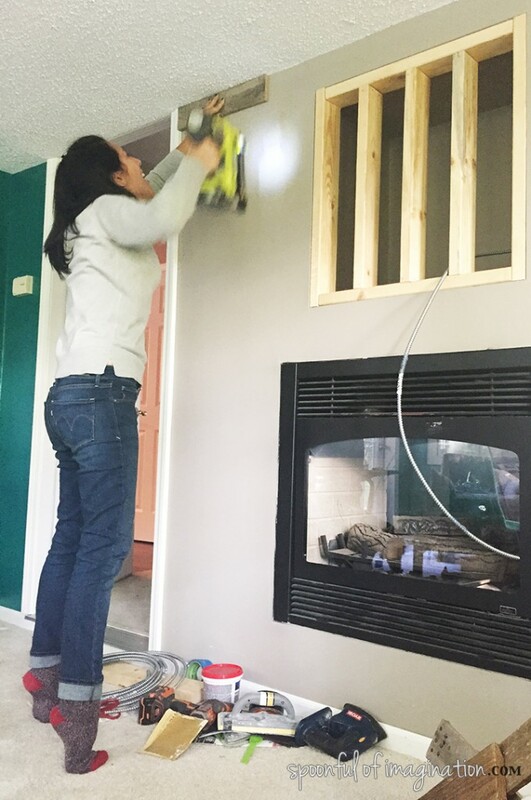 When we were ready to start, I simply picked a board to start with and used my brad nailer to attach it to the wall. We used four nails per a board. It was one nail per corner. 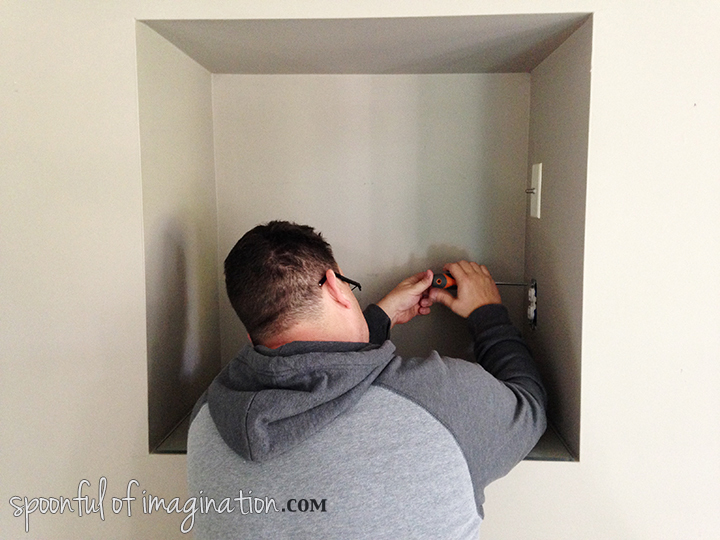 The only place where we didn’t put a nail in every corner was where we were covering up the open nook space. 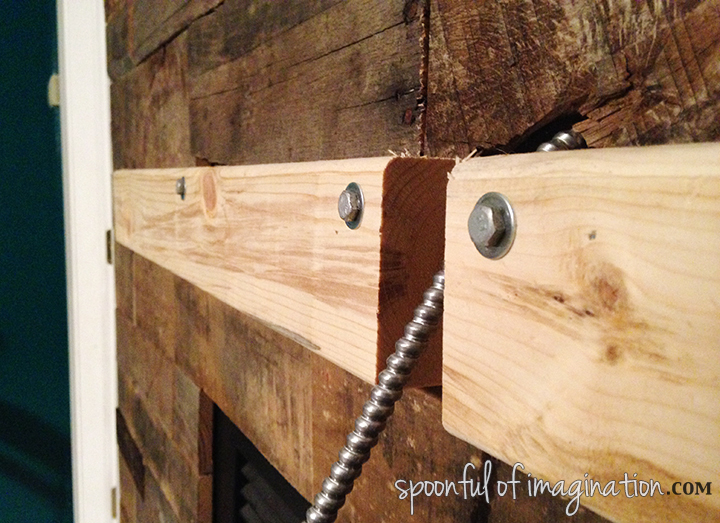 We attached the nails, so they would go into the studs that Matt had built. 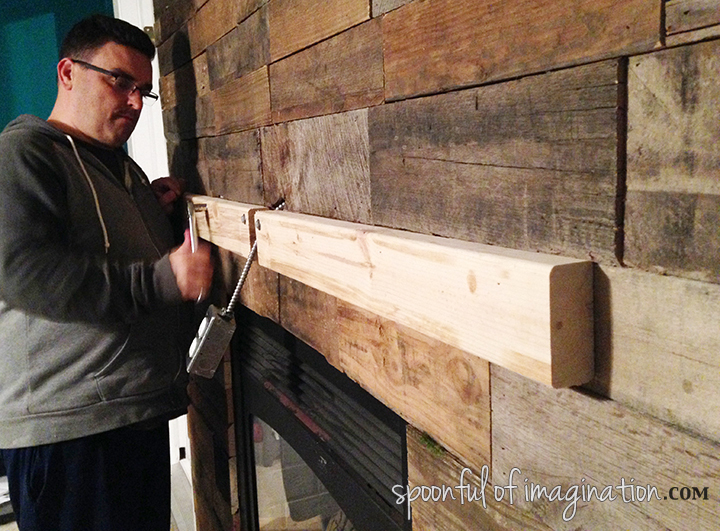 We also realized there was a chance the raw wood might show through, since pallet wood is not perfect. 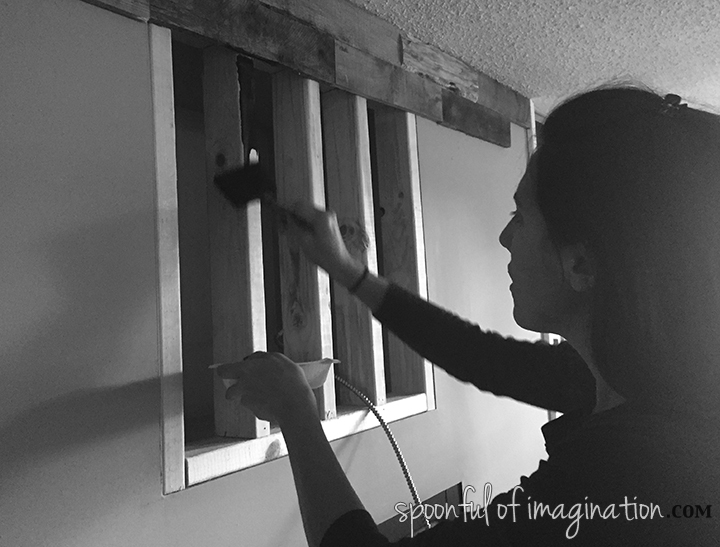 I went back to stain the stud boards so they were a darker color and not as obvious as raw wood peaking through the gaps in our pallet boards. Filling in the wall kind of felt like piecing a puzzle together. We didn’t want all of our ends to meet up together, so we intentionally would start a row placing a board in the middle of the seem of two boards in the row above. 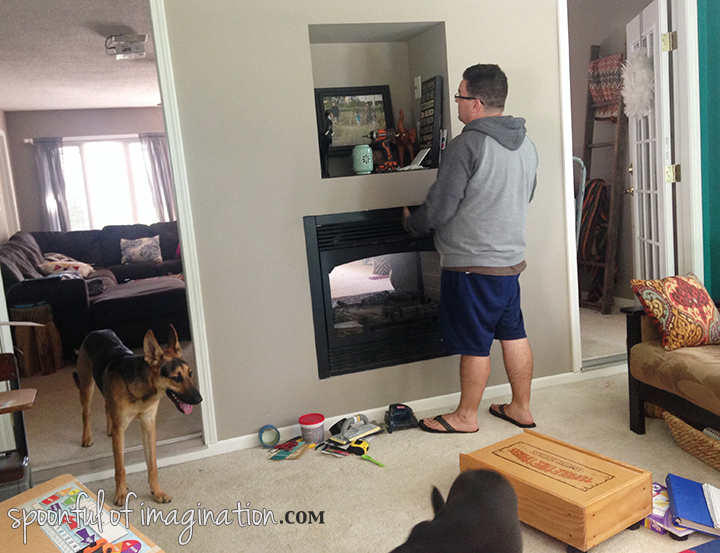 This little step created small spaces that needed filled with boards cut to a particular size (as shown below). In this scenario, we would mark a board where it needed cut and use our Ryobi Compound Miter Saw to trim that board to the correct size. Once it was cut, we could then nail it into the small gab and fill that puzzle piece space. 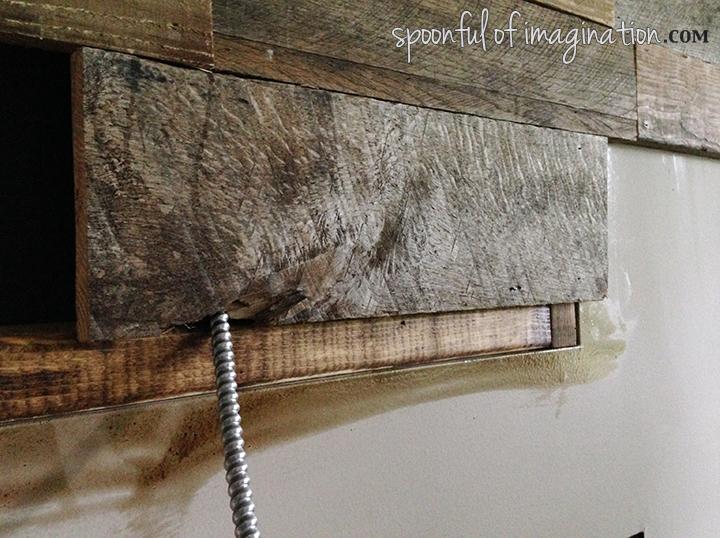 We intentionally picked a chipped board to be placed where the electrical outlet cord would be coming out. 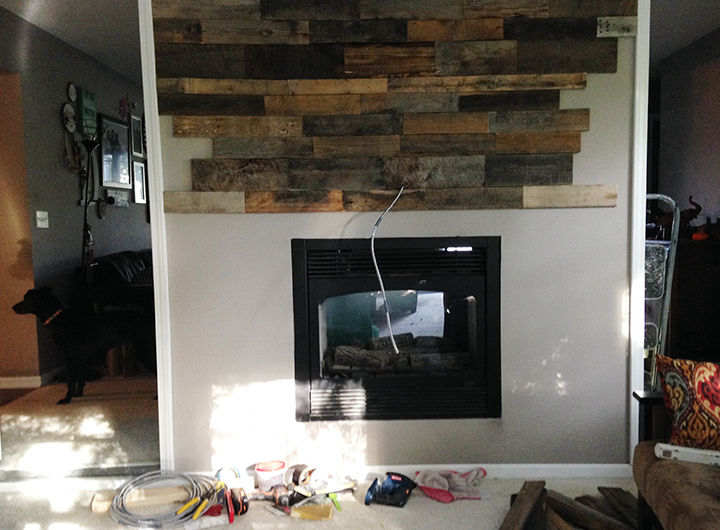 It worked perfectly to have the cord discreetly come out and have the wall still look rustic. After our longer rows were complete, we stood back and admired. It was so exciting and looked so good. One thing I will say about the way we cut our pallet wood: we were nervous about the short size of the boards. Instead of using the full 3-4ft width of a pallet board, the wood ended up being about half the width. 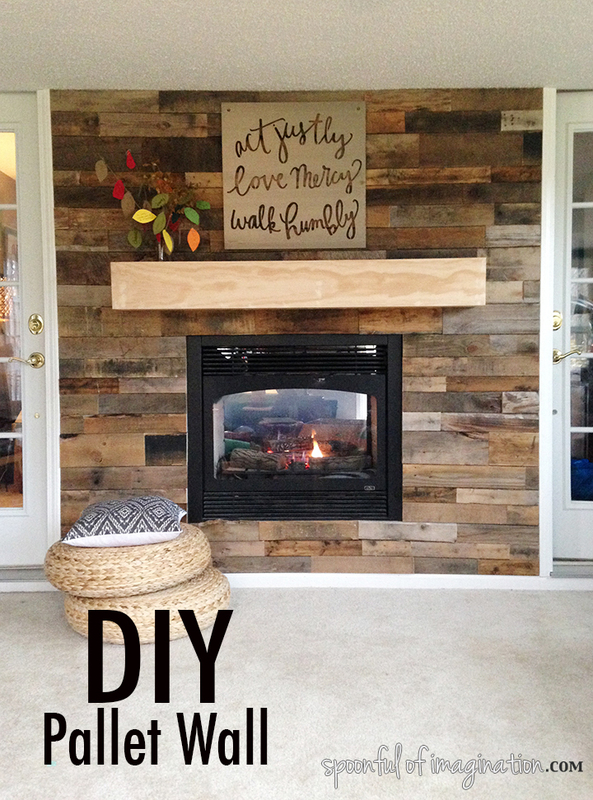 My fear was that the smaller boards would create more of a uniformed tile effect than a rustic wood look. It turned out great though. Once we stepped back and observed, we realized the longer boards on this small wall would not have worked as well. Because this is such a small wall, the small boards allowed for several boards to go across in one row which ultimately gave the wall more color and character. These size boards were perfect. At this point I started running with it and Matt went more on kid duty. We make a great team. I love how the wall came out! 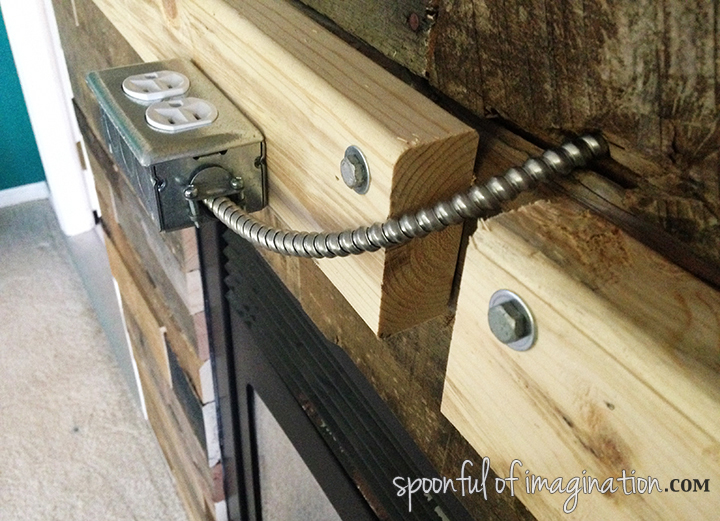 If you too are covering a hole or wanting an outlet, this next step is for you. We let our wall sit for a few weeks while life happened. 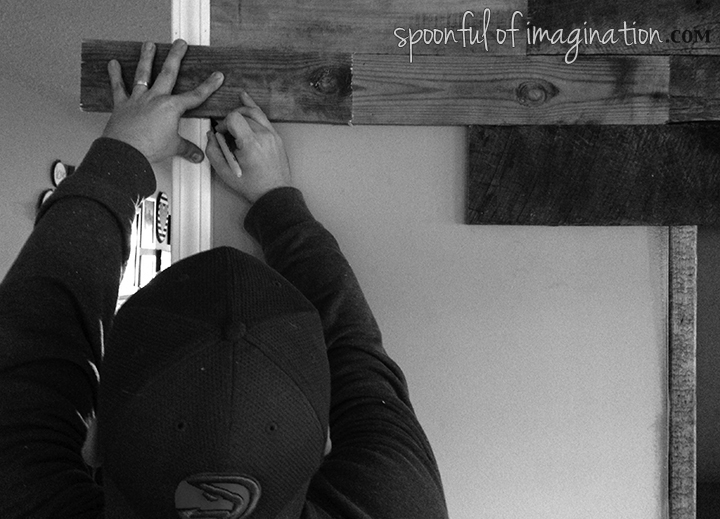 Matt did attach some 2×4’s to mount the electrical outlet and serve as the mount for the mantel that we would eventually create. My wall looks rustic and completely natural doesn’t it!? Let me fill you in on a little secret. There were a couple rows, where I ran out of various shades of different colored boards so two colors ended up being next to each other. It didn’t look right. So I poured a little stain on a cloth and ran it over a few boards to break up the color. You wouldn’t be able to tell unless I pointed them out to you. Now that you know, they totally are obvious aren’t they? To the unknown eye though, they just blend. Try that little trick… It helps. This room now feels so warm and inviting. It has huge windows, if you remember from my new home tour post. 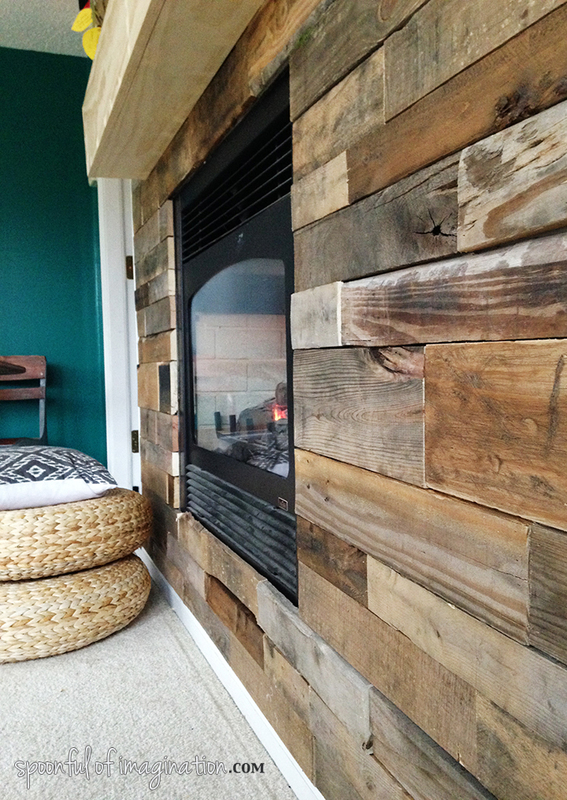 The rustic wood wall embedded with a fireplace just completes the look. It’s our very favorite room to hang in. It really only took us a day. We started sometime that morning deconstructing the pallets. We used four or five pallets total. We had our three kids and foster son with us all day and stopped for meals, ran interference with kids as we needed, tag teamed refereeing kid fights and still managed to get the wall complete in one day. It could have been quicker. We wouldn’t do it any other way though. 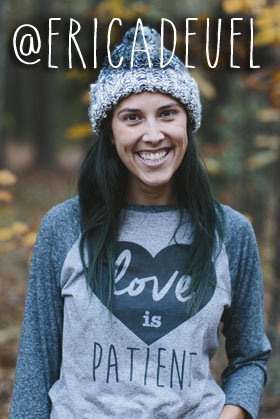 But I share the details of our day with you to let you know-don’t be intimidated! If we could do it that way, you can do it too! 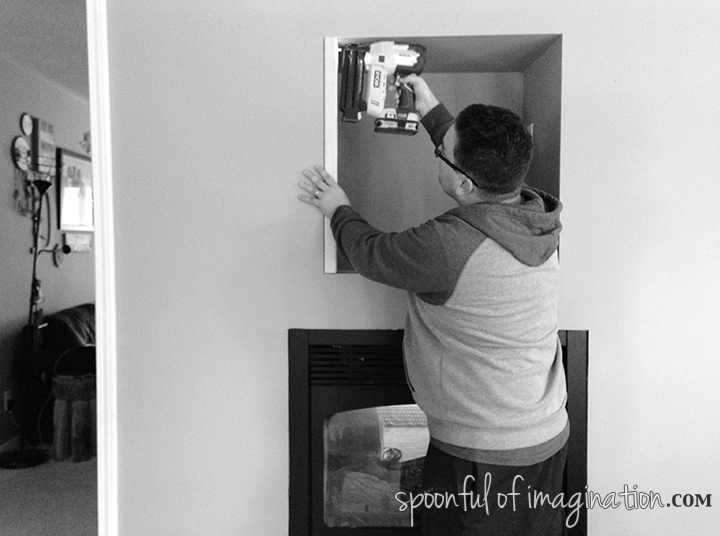 The key tool for us was really our brad nailer. 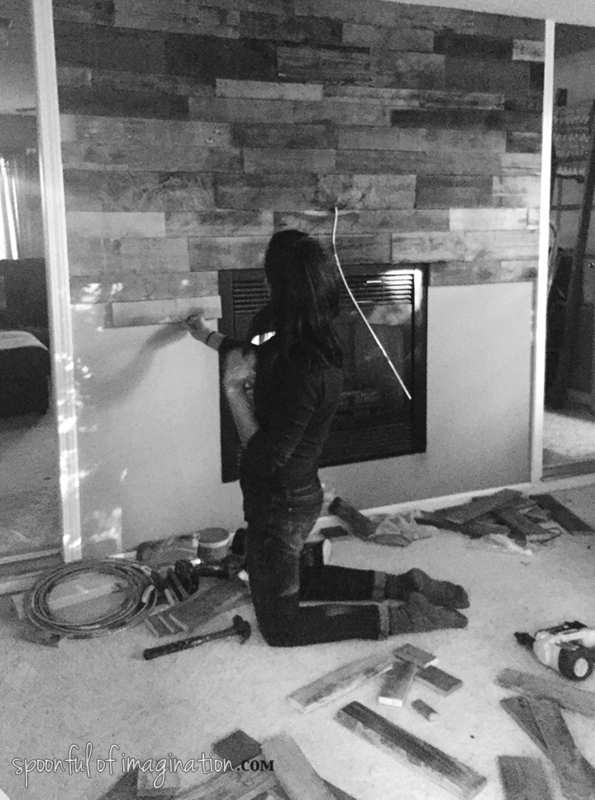 If you remember the shiplap wall we did in our last house that ended up being our previous foster son’s room, you know we didn’t have the brad nailer then. 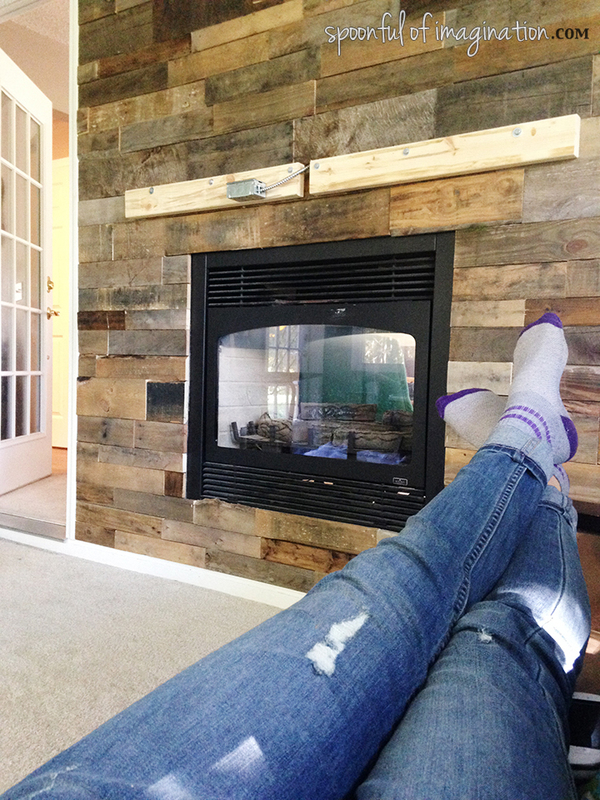 This new pallet wall is better and was so much quicker! The holidays are coming. Add this tool to your list. You won’t regret it. Please note: No one is paying me a thing to say that. It’s literally just our favorite tool on planet earth in the history of ever. That’s not an exaggeration. I’m still trying to decide on how to finish off our mantel. I am thinking a lighter stain, so it dulls the stark plain wood yet keeps the wood grain showing. How would you finish it off? I will show you soon how we made it and what finish we decided on. Thanks so much for following along! Love you, love the wall! I hope you are well my friend.